After the inaugural quarter of the First Year Experience, administrators are gathering feedback from about 460 students in the college transition program and considering structural changes for next year. 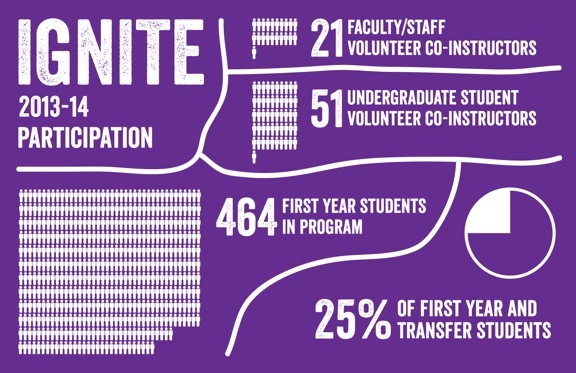 The program, also called IGNITE, was designed to be an extension of Wildcat Welcome. One quarter of the freshman class was enrolled in the program and met occasionally in small, peer adviser-led groups. Run by the Office of New Student and Family Programs, IGNITE is meant to help students with their transition into college. This year’s pilot program is as much an opportunity for gathering information as it is for ironing out programming problems, said Josh McKenzie, director of the First Year Experience. Students were randomly chosen and automatically enrolled in the program because they wanted a cross section of students from each school with different levels of enthusiasm, he said. According to statistics from the Office of New Student and Family Programs, 89 percent of students involved with IGNITE said they view it as important. However, 60 percent of students said they did not have the space to build meaningful relationships with others in the program. Attendance for all events is mandatory. Some students, however, were unhappy with the selection process, making them unwilling to engage in the program. Peer Adviser Eleanor McEnaney said she has had some issues with her group being reluctant to talk or questioning the program’s purpose, but even these moments seemed helpful. But beyond the numbers, McEnaney said she thinks IGNITE helps students feel welcome at the university and hopes the program will help students get involved on campus. Initially, off-campus events were planned for participants, but because of time constraints and the nature of a new program, students have only met in their small groups. Communication freshman Lizzie Frieder, who participated in the program, said it helped expand her network. McKenzie was unable to comment about any specific potential plans for the program’s future. For next year, he said the office was considering the possibility of students applying to participate in the program or enrolling all the first-year students in one specific school. He still sees this year as invaluable in helping shape the program. Ideally, he said IGNITE will help students reflect on their college experiences in a safe environment, something he believes is crucial. “What we want to do is drive that safe and open environment for students to not only be able to stop and reflect on who they are — so a little bit of self-exploration — but also what should Northwestern for you look like,” he said.